Now there’s a mystery to that! Especially with the Jimmy Buffet comment. The traffic flare works beautifully to conceal the identity of the determined shadowy figure. I know! It’s an interview with a Mafia figure and they’re concealing the identity of the snitch! No? Ha! Close but no Mafia. See my comments to Allyson… the Jimmy Buffet thing is ‘splained. My first thought is crime too. Illegal bags to exchange hands. Not just the lighting but the pose. The most amazing thing he told us was that tires are constantly being blown by tiny, unseen objects on the highway. First time for us. Very intriguing, but I can’t even begin to imagine the story behind it. Your truck? That pose — the stance and the arms crossed: you look either ticked or determined. A bit intimidating too! Where’s the driver? Or were you driving? I like the shadowiness of the shot, and the composition with the line of lights leading off to the horizon line, and the blur of headlights coming this way. When’s the reveal? Very good! I am, in fact, both ticked and determined in this shot. The CAA tow truck has finally arrived after about 45 minutes and several phone calls. We’d blown a tire on the 401 on our way back from a BBQ in Toronto… Margaritaville was the theme. So, to be precise, I am ticked, determined [not to lose my cool with the CAA guy who is now taking FOREVER to change the tire] AND dressed like Jimmy Buffet. On the 401. Haven’t looked at the other comments yet because I wanted to take a stab at solving the mystery. 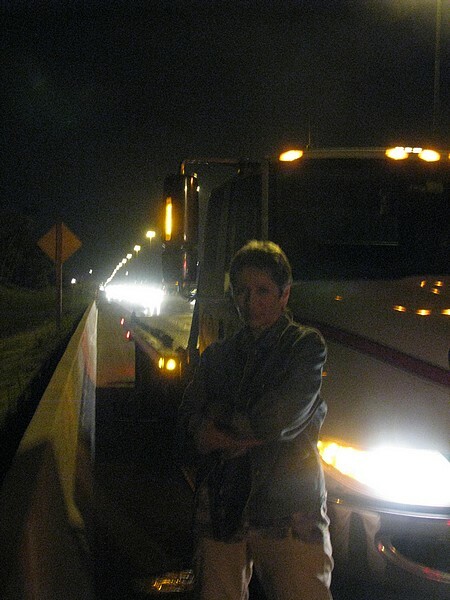 So … is that a flatbed tow truck, late at night with your broken down vehicle loaded up?! If so, then I’ve been there, done that; I am pretty sure I recognize that look on your face, Carin. Wonderful sense of mystery here — a very sanguine ‘central character” waiting for a dope drop, would be my first thought if this were a still from a movie. Arms crossed, thinking “This is taking way too long” but character X not getting in a flap.